Keeping your old headlights in good working order takes a commitment. You’ll need to make sure that they aren’t rusted or scratched beyond recognition. But what is the best way to keep your old headlights in pristine condition? You’ll need a headlight restoration kit. Most people have never heard of a headlight restoration kit, though. It’s very difficult to figure out what you need to be looking for in such a kit. In this article, we’ll explain to you the things you need to look for in a headlight restoration kit and walk you through a few of the best kits on the market, so you will know what you need. How Frequently Should I Use A Headlight Restoration Kit? Which Hazards Does A Headlight Restoration Kit Need To Protect Against? How Do I Avoid Damaging My Headlights While Renovating Them? Are All Headlight Restoration Kits Compatible With All Headlights? Now that you know a bit about the best headlight restoration kits on the market, it’s time to consider the features that they share in common which makes them great. First, headlight restoration kits should provide you with the tools you need for the job. You may not always have the perfect grain of sandpaper nearby. Likewise, while you certainly have a shammy or rag kicking around, you may not have one that is perfectly shaped to stress the headlight the least. When the kit provides these things for you along with the cleaning fluids, you will get the safest and most effective restoration. Second, good headlight restoration kits provide you with a sealant to keep the work you have done stay finished. If you don’t seal in the cleaning, your headlights will become dirty or corroded soon after you finish. There are many possible sealants, but most sealants provide a measure of UV protection. The more intense sealants might also provide moisture resistance, but this isn’t as important because it doesn’t harm the headlights as much so long as they are made from rust proof materials. The best headlight restoration kits have a good set of instructions that will help you to work through the process. Without an instruction set, you are in danger of applying the kit chemicals in the wrong order or otherwise incorrectly. Because many kits have a slightly different mix of chemicals, knowing how to use one cleaning kit does not guarantee that the procedure is the same for another. There is a slim chance that you can deal irreparable damage to your headlights by using the kit incorrectly. Typically, if you don’t use the headlight restoration kit properly, the treatment will fail to adhere. You will be able to notice immediately that the treatment is not working, so you should not get any nasty surprises down the line. Finally, great headlight restoration kits remove discoloration and rust from your headlights. After all, a kit wouldn’t be very good at restoration if it didn’t bring your headlights back into their factory-new condition. The best headlight restoration kits can perform this de-rusting and removal of discoloration without imparting any other discoloration of their own. The same must be true for the sealants and washing fluids in the kit. Typically, the sealant is the liquid which has the largest potential for imparting an additional layer of discoloration, so tread carefully when you are testing a new sealant on your headlight lenses. Weaker restoration kits may impart a lightly blue hue to your headlights, which might irritate you if that isn’t the authentic tint of the headlight lens. The Turtle Wax T-240KT Headlight Lens Restorer Kit has a handful of headlight restoration tools, including a lens wipe, a cleaning solution, and a lubricant. 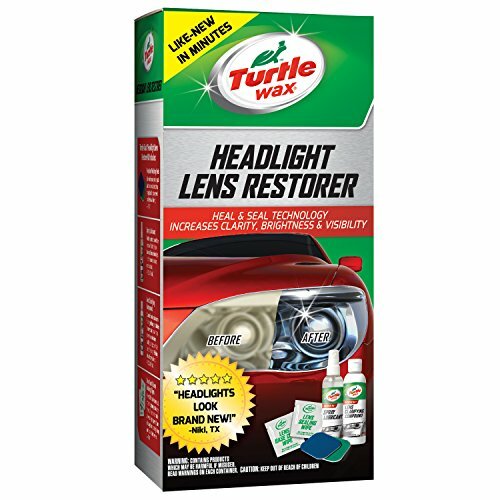 The Turtle Wax headlight lens restorer kit is only suitable for cleaning the lens of your headlights. In other words, it is intended for the most sensitive part that is the least likely to get damaged but the most likely to be hard to repair. As far as the equipment goes, the Turtle Wax kit will get all of the surface discoloration of the lens with a minimal amount of mechanical effort. This is ideal because the more physical force you apply to the lenses, the more likely they are to get damaged. Importantly, the Turtle Wax kit is a wet kit. There is no part of the process which involves dry components. Dry components have their place in serious renovation jobs, but they are usually more trouble than they are worth. The Turtle Wax kit has a sealant which is applied last. The sealant will ensure that you won’t need to perform another headlight renovation for a long period of time. The Sylvania Headlight Restoration Kit is a fully featured kit which is easy to use and offers warranty-backed results when you need them the most. 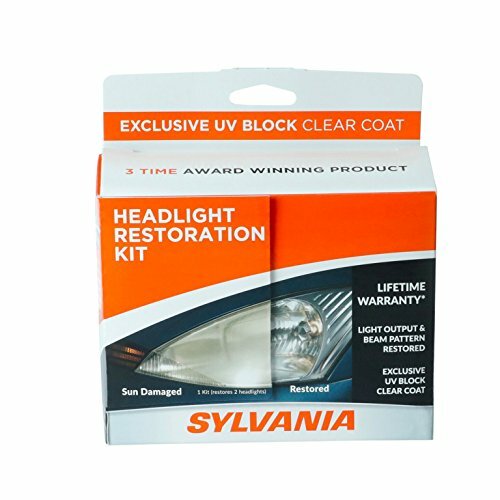 Unlike other headlight restoration kits, the Sylvania kit has built-in UV protection in its chemicals. Especially for people who spend a lot of time in very sunny environments with their car, this added measure of protection is a great feature. The Sylvania kit is not a purely wet kit. You will need to sand over any imperfections in the lens using a piece of sandpaper, which is very risky if you don’t know what you are doing. 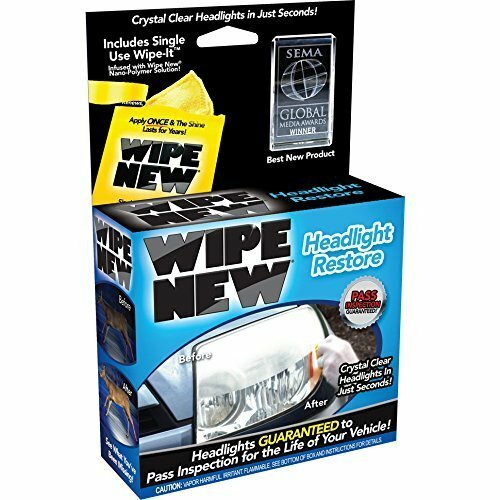 For people with some experience with headlight restoration, this kit might be perfect. Unfortunately, the Sylvania kit does not include the shammies or sandpaper, so you will need to provide your own. For most people, this is not a major concern. Nonetheless, if you are uncertain about what to purchase, you may accidentally end up with the wrong sandpaper. Using the wrong grain of sandpaper would be a major problem for a sensitive headlight lens, and so you should take care to read the instructions attentively before you use the kit. Luckily, the kit has a great instruction set, so you will be in good hands. 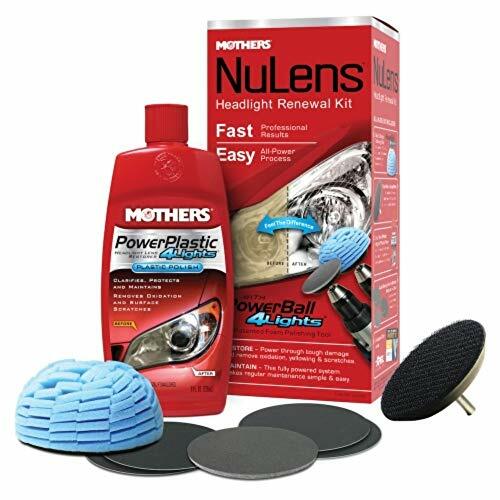 The Mothers 07251 NuLens Headlight Renewal Kit is a comprehensive lens renovation solution that contains everything you need to do a great job on your lenses. Other kits might not give you all the tools required for a real headlight renovation job, but the Mothers kit certainly does. The kit has cleaning fluids, sealant, and also sanding and shammying tools. The custom-built lens renovation tool in this kit is a winner. Though you only need to use it for a single step of the renovation process, it is the best tool for the job. The other items in the kit are also effective. The shammy is fitted to the shape of the lens, so you won’t need to apply much mechanical pressure to get results. Likewise, you won’t need to worry about chipping the edges of the lenses by applying pressure to the wrong spot. These features make the Mothers kit exceptionally good for older or more fragile headlights. Newer headlights can probably stand some abuse, but this kit will do a gentle job on them anyway. 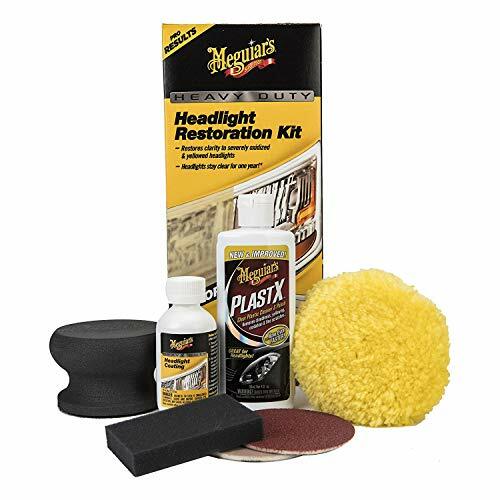 The Meguiar’s G2980 Heavy Duty Headlight Restoration Kit is another comprehensive headlight restoration and renovation kit which has a versatile set of tools you can use elsewhere in your car care process. This kit has a handful of tools that are of high quality. You’ll get a ball-style shammy, a foam pad, and several disc cleaning tools for the fine detail work on the headlight lenses. When this kit claims to be heavy-duty, it isn’t joking around. The shammy is coarse-grained, which will help you to get the most entrenched grime out of your lenses. Likewise, the cleaning discs are a bit more coarsely grained than you would otherwise expect from a renovation kit. There are upsides and also downsides to the graininess of the discs. You can definitely use these elsewhere in your car maintenance pipeline. You should take care when you use them on old or more fragile lenses. The Wipe New HDL6PCMTRRT Headlight Restore Kit is a standard restoration package which accomplishes most of what it sets out to do. The Wipe New kit is intended for basic cleaning jobs which can be completed quickly and easily. This is not the kit for deep cleaning, nor is it the kit for the most sensitive cleaning job. If you are trying to find a simple kit which you can use several times per year, this is the right kit. The cleaning tools in this kit are very minimal, so you will need to provide your own shammies and sandpapers if necessary. Likewise, the instruction set is minimal. On the bright side, it is very difficult to damage your headlights during renovation with this kit. Headlight restoration kits are made to be used as frequently as necessary. For most headlights and most cars, this means that you will be using your headlight restoration kit very sparingly. If you have to use your headlight restoration kit more than once every few years, you may have an issue with your car’s trim where it meets the headlight enclosure. You shouldn’t use your headlight restoration kit more than is necessary because restoring your headlights is a risky procedure. There is a high chance of causing damage to the lenses every time you restore them. So, better headlight restoration kits which provide a measure of passive protection won’t put your headlights at risk as frequently as weaker kits. There are several hazards for your headlights. First, dust and grime. Dust and grime are nearly always kept on the outside of the headlight enclosure by the covers and your vehicle’s trim. But, if they manage to get inside, your headlights are in deep trouble. Typically, the biggest hazard to your headlights is the sun, however. Ultraviolet radiation damages the lenses and any plastic pieces of your headlights over time, and there is rarely any refuge if you park your car outside. Effective headlight restoration kits will come with a sealant that protects your headlight lenses from the sun. Headlight restoration kits have instruction sets which guide you through the cleaning process. You should always follow these instructions very carefully. Aside from following the instructions, there are a few best practices which will help you avoid damaging your lenses. First, you should be wearing latex or nitrile gloves while performing any kind of intensive restoration. Your fingers have oil on them which can damage and blot the headlight lenses, so you need to protect them. Likewise, many headlight restoration kits contain chemicals which you do not want to come into contact with your hands. These chemicals may cause cancer or irritation. Next, don’t be afraid to pick off larger pieces of debris with your hands gently before starting the cleaning process. Leaving these pieces on can make the entire process much more hazardous for your headlights. Except in very specific circumstances, you don’t need to worry about your headlights being compatible with the headlight restoration kit of your choice. While very old or brittle headlights may be better off with more sensitive cleaning kits, you can still use kits not intended specifically for that purpose.